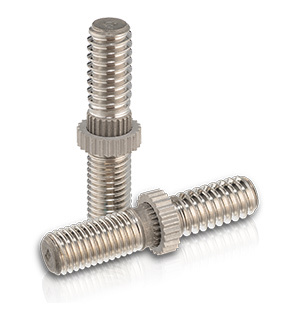 Size-on-size studs are similar to ring locked studs except that both threads have the same nominal diameter. This feature allows the stud to be installed into minimum size bosses. The captivated lock-ring provides a positive lock against rotation, transferring high torque loads from the stud to the base material while the stud threads resist tension loads. Manufactured in A286 corrosion-resistant steel. Lock rings are made from CRES 5640/303 stainless steel material or UNS 30300 material.